a complete set of seven Japanese piercing Yajiri (Yanone) hand forged iron arrows heads. Signed with the pierced Mori clan family crest. Watakusi (Flesh Terror / Barbed) These shapes are usually very ornamental in form and would have been originally used in battle. 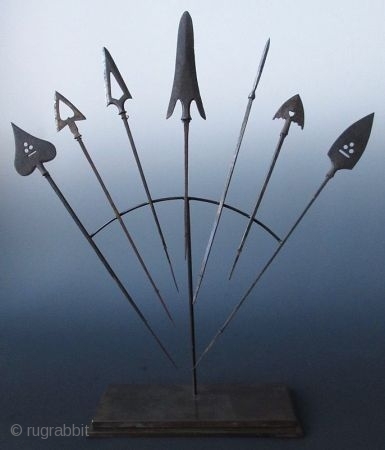 Each arrowheads can vary in length from 1 inch to over 6 inches and most have a saw cut piercing. The Mei (signature) on this style of arrowhead would usually be located on the nakago. The pierced designs vary from Inome (boar's eye) to triangular saw-cut areas. These piercing are usually on the flat surface between the angled faces of the blade. The hamon can vary from a normal suguha (straight temper) to Gunome-midare (irregular wavy line). Some Watakusi even have double barbs and significant carved shoulders. Mounted in splayed open fan shape on custom antiqued bronze finished stand.